American solar satellite. The IMAGE spacecraft imaged remote particle populations in the magnetosphere. Research satellite built by Lockheed Martin Missiles & Space (Sunnyvale) for NASA, USA. Launched 2000. AKA: Imager for Magnetopause-to-Aurora Global Exploration. Status: Operational 2000. First Launch: 2000-03-25. Last Launch: 2000-03-25. Number: 1 . Gross mass: 494 kg (1,089 lb). Height: 1.52 m (4.98 ft). Span: 250.00 m (820.00 ft). These allowed detailed study of the interaction of the solar wind with the magnetosphere and the magnetosphere's response during a magnetic storm. IMAGE was the first of its kind, designed to actually "see" most of the major charged particle systems in the space surrounding Earth. Previous spacecraft explored the magnetosphere by detecting particles and fields they encountered as they passed through them. This technique limited their "vision" to small portions of this vast and dynamic field, which extends about 40,000 miles on Earth's day side and about 110,000 miles on Earth's night side. It would be similar to attempt understanding the nature of the world's oceans from a single buoy. Just as taking a photograph of the night sky allows astronomers to count and study millions of stars at once, images returned by the IMAGE spacecraft were to provide simultaneous measurements of the densities, energies and masses of charged particles throughout the inner magnetosphere using three-dimensional imaging techniques. High Energy Neutral Atom (HENA) imager, Johns Hopkins University Applied Physics Laboratory, Laurel, Md. Central Instrument Data Processor (CIDP), SwRI. IMAGE was the first of two scheduled Medium-class Explorer missions NASA. The total cost of the mission, including spacecraft, launch vehicle and mission operations for the first two years was $154 million. The IMAGE Project Office at Goddard managed the mission for NASA's Office of Space Science in Washington, D.C., while the principal investigator at SwRI had overall responsibility for the science, instrumentation, spacecraft and data analyses. Lockheed Martin Missiles and Space of Lockheed, Calif. built the IMAGE spacecraft under contract with SwRI. 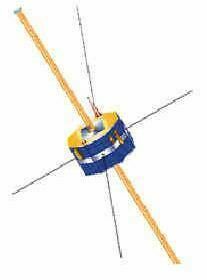 On orbit, the RPI antennas aboard IMAGE extended 10 m parallel to the spin axis and 250 m in four directions perpendicular to the spin axis, making IMAGE the longest spacecraft then in orbit. Electric System: 0.286 average kW. 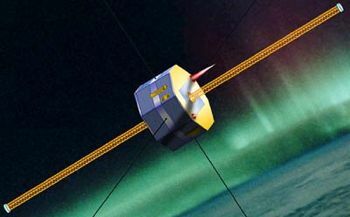 IMAGE (Imager for Magnetopause-to-Aurora Global Exploration) was a MIDEX class mission, selected by NASA in 1996, to study the global response of the Earth's magnetosphere to changes in the solar wind. IMAGE was launched March 25, 2000 into a highly elliptical polar orbit with initial geocentric apogee of 8.2 Earth radii and perigee altitude of 1000 km. IMAGE used neutral atom, ultraviolet, and radio imaging techniques to: (a) identify the dominant mechanisms for injecting plasma into the magnetosphere on substorm and magnetic storm time scales; (b) determine the directly driven response of the magnetosphere to solar wind changes; and, (c) discover how and where magnetospheric plasmas are energized, transported, and subsequently lost during substorms and magnetic storms. In order to fulfill its science goals, IMAGE utilized neutral atom, ultraviolet, and radio imaging techniques. A suite of three neutral atom imagers (NAI) provided energy- and composition-resolved images at energies from 10 eV to 200 keV with a time resolution of 300 seconds. Two ultraviolet imagers, covering wavelength ranges from 120-180 nm (FUV) and 30.4 nm (EUV), provided coverage in the far and extreme ultraviolet. The radio plasma imager (RPI) was a low-power radar which operated in the radio frequency bands which contain the plasma resonance frequencies characteristic of the Earth's magnetophere (3 kHz to 3 MHz). Family: Earth, High earth orbit, Solar. Country: USA. Launch Vehicles: Thor, Delta, Delta 2 7000, Delta 7326-9.5. Launch Sites: Vandenberg, Vandenberg SLC2W. Agency: NASA, Lockheed. Bibliography: 2, 3810, 3811, 552, 554, 12649. 2000 March 25 - . 20:34 GMT - . Launch Site: Vandenberg. Launch Complex: Vandenberg SLC2W. LV Family: Thor. Launch Vehicle: Delta 7326-9.5. IMAGE - . Mass: 536 kg (1,181 lb). Nation: USA. Agency: NASA Greenbelt. Manufacturer: Lockheed. Class: Earth. Type: Ionosphere satellite. Spacecraft: IMAGE. USAF Sat Cat: 26113 . COSPAR: 2000-017A. Apogee: 45,461 km (28,248 mi). Perigee: 1,408 km (875 mi). Inclination: 89.43 deg. Period: 854.09 min. Imager for Magnetopause to Aurora Global Exploration was a MIDEX (mid-sized Explorer mission) developed by NASA-Goddard and the SWRI (Southwest Research Institute) of San Antonio, Texas. The spin-stabilised spacecraft carried a set of neutral atom and ultraviolet imagers, and antennae to study radio wavelength emissions from the magnetosphere plasma. The RPI radio plasma imager has four long wire antennae which will be deployed to a span of half a kilometre.